1 A None No Power Seat 1 A is an Economy Class Exit Row seat. Volaris Airlines designates this seat as a Premium seat and is charging an additional fee for it. The Premium seats offer additional legroom. The tray table is in the armrest, making the armrest immovable and slightly reducing seat width. The proximity to the galley and lavatory may be bothersome. There is no floor storage during takeoff and landing. 1 B None No Power Seat 1 B is an Economy Class Exit Row seat. Volaris Airlines designates this seat as a Premium seat and is charging an additional fee for it. The Premium seats offer additional legroom. The tray table is in the armrest, making the armrest immovable and slightly reducing seat width. The proximity to the galley and lavatory may be bothersome. There is no floor storage during takeoff and landing. 1 C None No Power Seat 1 C is an Economy Class Exit Row seat. Volaris Airlines designates this seat as a Premium seat and is charging an additional fee for it. The Premium seats offer additional legroom. The tray table is in the armrest, making the armrest immovable and slightly reducing seat width. The proximity to the galley and lavatory may be bothersome. There is no floor storage during takeoff and landing. 1 D None No Power Seat 1 D is an Economy Class Exit Row seat. Volaris Airlines designates this seat as a Premium seat and is charging an additional fee for it. The Premium seats offer additional legroom. The tray table is in the armrest, making the armrest immovable and slightly reducing seat width. The proximity to the galley and lavatory may be bothersome. There is no floor storage during takeoff and landing. 1 E None No Power Seat 1 E is an Economy Class Exit Row seat. Volaris Airlines designates this seat as a Premium seat and is charging an additional fee for it. The Premium seats offer additional legroom. The tray table is in the armrest, making the armrest immovable and slightly reducing seat width. The proximity to the galley and lavatory may be bothersome. There is no floor storage during takeoff and landing. 1 F None No Power Seat 1 F is an Economy Class Exit Row seat. Volaris Airlines designates this seat as a Premium seat and is charging an additional fee for it. The Premium seats offer additional legroom. The tray table is in the armrest, making the armrest immovable and slightly reducing seat width. The proximity to the galley and lavatory may be bothersome. There is no floor storage during takeoff and landing. 11 A None No Power Seat 11 A is an Economy Class seat that may have limited or no recline due to the exit row behind. 11 B None No Power Seat 11 B is an Economy Class seat that may have limited or no recline due to the exit row behind. 11 C None No Power Seat 11 C is an Economy Class seat that may have limited or no recline due to the exit row behind. 11 D None No Power Seat 11 D is an Economy Class seat that may have limited or no recline due to the exit row behind. 11 E None No Power Seat 11 E is an Economy Class seat that may have limited or no recline due to the exit row behind. 11 F None No Power Seat 11 F is an Economy Class seat that may have limited or no recline due to the exit row behind. 12 A None No Power Seat 12 A is an Economy Class Exit Row seat. Volaris Airlines designates this seat as a Premium seat and is charging an additional fee for it. The Premium seats offer additional legroom. This seat does not recline due to the exit row behind. The tray table is in the armrest, making the armrest immovable and slightly reducing seat width. There is no floor storage during takeoff and landing. 12 B None No Power Seat 12 B is an Economy Class Exit Row seat. Volaris Airlines designates this seat as a Premium seat and is charging an additional fee for it. The Premium seats offer additional legroom. This seat does not recline due to the exit row behind. The tray table is in the armrest, making the armrest immovable and slightly reducing seat width. There is no floor storage during takeoff and landing. 12 C None No Power Seat 12 C is an Economy Class Exit Row seat. Volaris Airlines designates this seat as a Premium seat and is charging an additional fee for it. The Premium seats offer additional legroom. This seat does not recline due to the exit row behind. The tray table is in the armrest, making the armrest immovable and slightly reducing seat width. There is no floor storage during takeoff and landing. 12 D None No Power Seat 12 D is an Economy Class Exit Row seat. Volaris Airlines designates this seat as a Premium seat and is charging an additional fee for it. The Premium seats offer additional legroom. This seat does not recline due to the exit row behind. The tray table is in the armrest, making the armrest immovable and slightly reducing seat width. There is no floor storage during takeoff and landing. 12 E None No Power Seat 12 E is an Economy Class Exit Row seat. Volaris Airlines designates this seat as a Premium seat and is charging an additional fee for it. The Premium seats offer additional legroom. This seat does not recline due to the exit row behind. The tray table is in the armrest, making the armrest immovable and slightly reducing seat width. There is no floor storage during takeoff and landing. 12 F None No Power Seat 12 F is an Economy Class Exit Row seat. Volaris Airlines designates this seat as a Premium seat and is charging an additional fee for it. The Premium seats offer additional legroom. This seat does not recline due to the exit row behind. The tray table is in the armrest, making the armrest immovable and slightly reducing seat width. There is no floor storage during takeoff and landing. 13 A None No Power Seat 13 A is an Economy Class Exit Row seat. Volaris Airlines designates this seat as a Premium seat and is charging an additional fee for it. The Premium seats offer additional legroom. 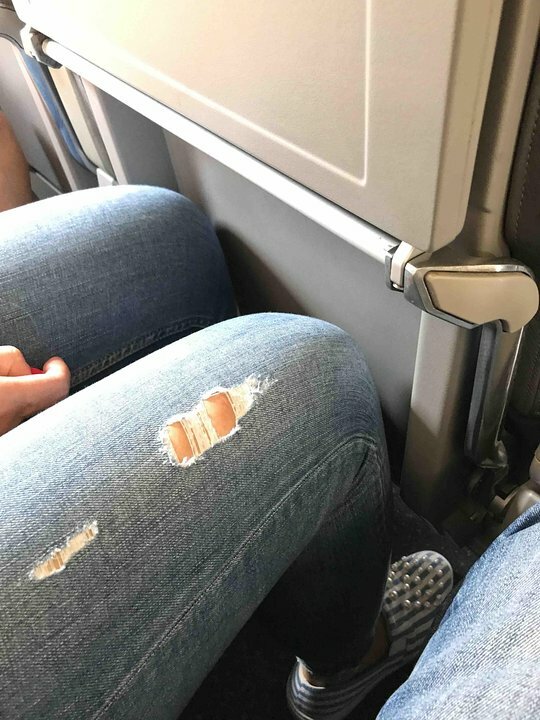 The seat in front does not recline, giving you more personal space. The tray table is in the armrest, making the armrest immovable and slightly reducing seat width. There is no floor storage during takeoff and landing. 13 B None No Power Seat 13 B is an Economy Class Exit Row seat. Volaris Airlines designates this seat as a Premium seat and is charging an additional fee for it. The Premium seats offer additional legroom. The seat in front does not recline, giving you more personal space. The tray table is in the armrest, making the armrest immovable and slightly reducing seat width. There is no floor storage during takeoff and landing. 13 C None No Power Seat 13 C is an Economy Class Exit Row seat. Volaris Airlines designates this seat as a Premium seat and is charging an additional fee for it. The Premium seats offer additional legroom. The seat in front does not recline, giving you more personal space. The tray table is in the armrest, making the armrest immovable and slightly reducing seat width. There is no floor storage during takeoff and landing. 13 D None No Power Seat 13 D is an Economy Class Exit Row seat. Volaris Airlines designates this seat as a Premium seat and is charging an additional fee for it. The Premium seats offer additional legroom. The seat in front does not recline, giving you more personal space. The tray table is in the armrest, making the armrest immovable and slightly reducing seat width. There is no floor storage during takeoff and landing. 13 E None No Power Seat 13 E is an Economy Class Exit Row seat. Volaris Airlines designates this seat as a Premium seat and is charging an additional fee for it. The Premium seats offer additional legroom. The seat in front does not recline, giving you more personal space. The tray table is in the armrest, making the armrest immovable and slightly reducing seat width. There is no floor storage during takeoff and landing. 13 F None No Power Seat 13 F is an Economy Class Exit Row seat. Volaris Airlines designates this seat as a Premium seat and is charging an additional fee for it. The Premium seats offer additional legroom. The seat in front does not recline, giving you more personal space. The tray table is in the armrest, making the armrest immovable and slightly reducing seat width. There is no floor storage during takeoff and landing. 2 A None No Power Seat 2 A is an Economy Class seat. Volaris Airlines designates this seat as a Premium seat and is charging an additional fee for it. The Premium seats offer additional legroom. 2 B None No Power Seat 2 B is an Economy Class seat. Volaris Airlines designates this seat as a Premium seat and is charging an additional fee for it. The Premium seats offer additional legroom. 2 C None No Power Seat 2 C is an Economy Class seat. Volaris Airlines designates this seat as a Premium seat and is charging an additional fee for it. The Premium seats offer additional legroom. 2 D None No Power Seat 2 D is an Economy Class seat. Volaris Airlines designates this seat as a Premium seat and is charging an additional fee for it. The Premium seats offer additional legroom. 2 E None No Power Seat 2 E is an Economy Class seat. Volaris Airlines designates this seat as a Premium seat and is charging an additional fee for it. The Premium seats offer additional legroom. 2 F None No Power Seat 2 F is an Economy Class seat. Volaris Airlines designates this seat as a Premium seat and is charging an additional fee for it. The Premium seats offer additional legroom. 28 C None No Power Seat 28 C is a standard Economy Class seat. However, the proximity to the lavatory can be bothersome. 28 D None No Power Seat 28 D is a standard Economy Class seat. However, the proximity to the lavatory can be bothersome. 29 A None No Power Seat 29 A is an Economy Class seat located in the last row of the plane. This seat may have limited recline. The proximity to the lavatory and galley may be bothersome. Also, you will be among the last passengers to deplane upon arrival. 29 B None No Power Seat 29 B is an Economy Class seat located in the last row of the plane. This seat may have limited recline. The proximity to the lavatory and galley may be bothersome. Also, you will be among the last passengers to deplane upon arrival. 29 C None No Power Seat 29 C is an Economy Class seat located in the last row of the plane. This seat may have limited recline. The proximity to the lavatory and galley may be bothersome. Also, you will be among the last passengers to deplane upon arrival. 29 D None No Power Seat 29 D is an Economy Class seat located in the last row of the plane. This seat may have limited recline. The proximity to the lavatory and galley may be bothersome. Also, you will be among the last passengers to deplane upon arrival. 29 E None No Power Seat 29 E is an Economy Class seat located in the last row of the plane. This seat may have limited recline. The proximity to the lavatory and galley may be bothersome. Also, you will be among the last passengers to deplane upon arrival. 29 F None No Power Seat 29 F is an Economy Class seat located in the last row of the plane. This seat may have limited recline. The proximity to the lavatory and galley may be bothersome. Also, you will be among the last passengers to deplane upon arrival. 3 A None No Power Seat 3 A is an Economy Class seat. Volaris Airlines designates this seat as a Premium seat and is charging an additional fee for it. The Premium seats offer additional legroom. 3 B None No Power Seat 3 B is an Economy Class seat. Volaris Airlines designates this seat as a Premium seat and is charging an additional fee for it. The Premium seats offer additional legroom. 3 C None No Power Seat 3 C is an Economy Class seat. Volaris Airlines designates this seat as a Premium seat and is charging an additional fee for it. The Premium seats offer additional legroom. 3 D None No Power Seat 3 D is an Economy Class seat. Volaris Airlines designates this seat as a Premium seat and is charging an additional fee for it. The Premium seats offer additional legroom. 3 E None No Power Seat 3 E is an Economy Class seat. Volaris Airlines designates this seat as a Premium seat and is charging an additional fee for it. The Premium seats offer additional legroom. 3 F None No Power Seat 3 F is an Economy Class seat. Volaris Airlines designates this seat as a Premium seat and is charging an additional fee for it. The Premium seats offer additional legroom. 4 A None No Power Seat 4 A is an Economy Class seat. Volaris Airlines designates this seat as a Premium seat and is charging an additional fee for it. The Premium seats offer additional legroom. 4 B None No Power Seat 4 B is an Economy Class seat. Volaris Airlines designates this seat as a Premium seat and is charging an additional fee for it. The Premium seats offer additional legroom. 4 C None No Power Seat 4 C is an Economy Class seat. Volaris Airlines designates this seat as a Premium seat and is charging an additional fee for it. The Premium seats offer additional legroom. 4 D None No Power Seat 4 D is an Economy Class seat. Volaris Airlines designates this seat as a Premium seat and is charging an additional fee for it. The Premium seats offer additional legroom. 4 E None No Power Seat 4 E is an Economy Class seat. Volaris Airlines designates this seat as a Premium seat and is charging an additional fee for it. The Premium seats offer additional legroom. 4 F None No Power Seat 4 F is an Economy Class seat. Volaris Airlines designates this seat as a Premium seat and is charging an additional fee for it. The Premium seats offer additional legroom. 5 A None No Power Seat 5 A is an Economy Class seat. Volaris Airlines designates this seat as a Premium seat and is charging an additional fee for it. The Premium seats offer additional legroom. 5 B None No Power Seat 5 B is an Economy Class seat. Volaris Airlines designates this seat as a Premium seat and is charging an additional fee for it. The Premium seats offer additional legroom. 5 C None No Power Seat 5 C is an Economy Class seat. Volaris Airlines designates this seat as a Premium seat and is charging an additional fee for it. The Premium seats offer additional legroom. 5 D None No Power Seat 5 D is an Economy Class seat. Volaris Airlines designates this seat as a Premium seat and is charging an additional fee for it. The Premium seats offer additional legroom. 5 E None No Power Seat 5 E is an Economy Class seat. Volaris Airlines designates this seat as a Premium seat and is charging an additional fee for it. The Premium seats offer additional legroom. 5 F None No Power Seat 5 F is an Economy Class seat. Volaris Airlines designates this seat as a Premium seat and is charging an additional fee for it. The Premium seats offer additional legroom. Volaris Airlines operates the Airbus A320 on short-haul flights. This aircraft flies solely with 174 seats of Economy Class. 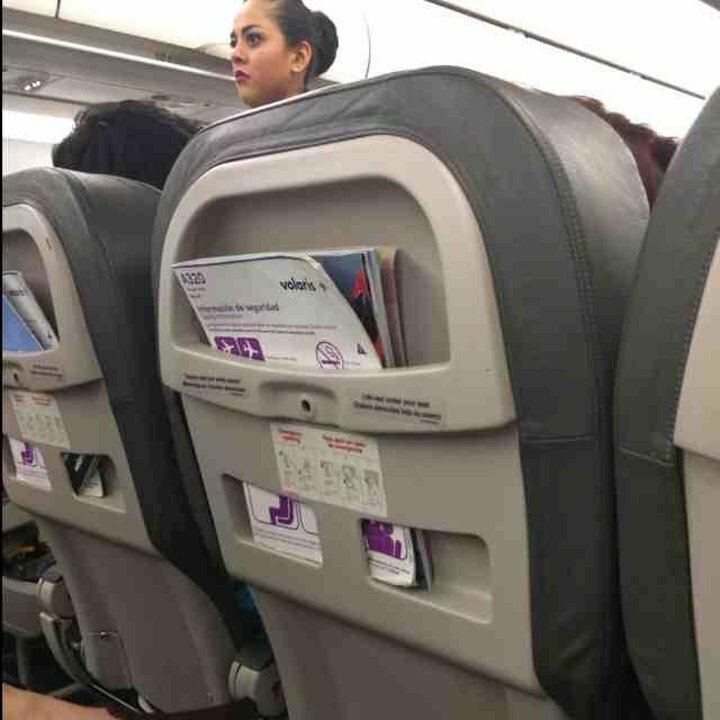 Volaris Airlines offers passengers Premium seats. The Premium seats are located in rows 1-5 and the exit rows and have additional legroom. These seats can be booked for an extra fee. This seat was perfectly fine for the 3 hour trip MEX-MXL. The leg room was fine and the seat width was more than sufficient. The uncovered plastic seat back was jarring on my knees when the passenger in front of me reclined the seat rapidly. The seat back pocket is a slot in the plastic seat back. Once the in flight magazine, the menu and saftey card where in the slot, there is only space for a slim volume of poetry. I would have killed for a seat this spacious on the 11 hour flight LHR-MEX. BA take note. 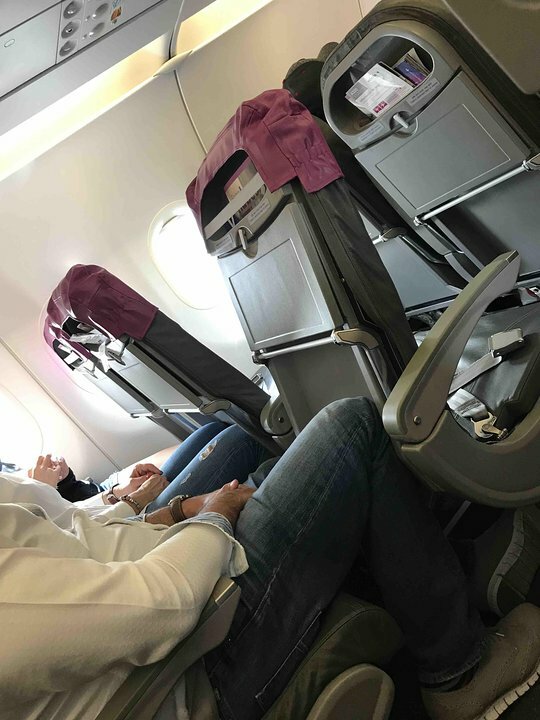 Beware Volaris does not seem to change Premium seat assignments when they change aircraft. We flew down on an A319 with Row 10 Premium seating but the return flight was an A320 and Row 10 was standard Economy and a rather hard seat cushion in my opinion. Great seat, lots of space. I hated this seat so much! Its a fake seat that has no pillow for the head like all the other seats do! Very crampy space for feet. Bathrooms are very big bother! No recline and my back started to hurt because it was a 4 hour flight from Mexico City to Los Ángeles! The seat spacing very limited. Impossible to sit with my legs in front of me, I had to sit sideways. Thankfully there was no one it the middle seat. If you are over 1.70 m tall forget travelling with Volaris unless you want to suffer. I flew many times with volaris on A319 & A320 in 10A and 13A seat respectively, I paid an extra fee for these seat, but If theres a kyosco in the Airport you are departing from, you could make the check in there, and if these are available, you could choose them for free. Volaris went from being a nice lowcost airline with a Hip product, to an ultra low cost carrier. This has led to a decrease in the product. Seats are now more crammed, they managed to fit an extra row to the plane. with now 30 rows and 180 passengers, so legroom is very tight. Also the newer planes do not have IFE or mood lightning. Neither ports in between seats as the older planes did. But they get you safe and cheap to your destination, no more than that. Los asientos en este avion son tan estrechos que no pude estirar las piernas debajo del asiento delante. Cuando se reclina el de adelante, el cabezal queda a menos de 15cm de mi cara. Soy delgado y mido 1.80 m. Es horrible! Volaris flies 1 versions of Airbus A320.